It’s no secret; I enjoy moving. Since the age of 18, I have relocated my primary residence no less than 15 times. Perhaps it’s the change of scenery or the act of purging and replenishing, but every two years or so I get the itch to pack up and move. Through the years I have evolved from my father’s station wagon to a rented truck to hiring a moving company. Though all of my moves had been within a 90-minute radius of Boston, I felt confident that I had the process of moving down to a science. Then two years ago I was offered a great opportunity in Wisconsin. Fortunately, my new employer paid for my relocation, so the trip out there was fairly easy and well managed. But after two years the wanderlust in me kicked in, as well as a bit of homesickness, and I recently found myself putting my house on the market and planning my move home to New England. The obstacles and challenges I faced managing this move held many lessons for me, which I can now share with my real estate clients. When you pack your household yourself, you can save hundreds, if not thousands, of dollars on labor and supply charges. Did you know it could cost you up to $100 just to have movers pack that picture hanging over your couch? I also suggest you learn how to disassemble and reassemble your furniture yourself, as this can save you considerably. 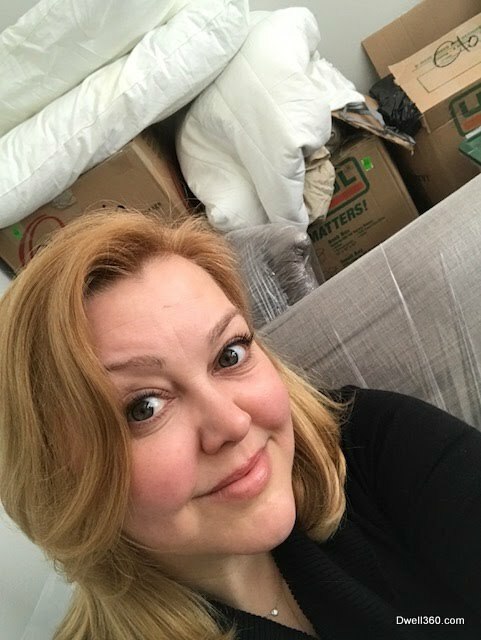 If you go the self-packing route as I did, be prepared: packing up your household yourself is a workout! Make sure you leave yourself at least a week to complete this heavy task. I am pleased to share that I have almost lost all the weight I gained from that delicious WI beer and cheese! Plus, I can now offer my services to help you with that Swedish furniture puzzle you are trying to solve. Do you really need that gently used red sleeper sofa that your friend gifted you after their last move? Is it going to cost more to bubble wrap, pack, and ship that old lamp than to buy a trendy new one for your new house? The process of moving is a great opportunity to purge and begin anew. Take stock of what you really need, then contact local charities, drop off at donation centers, or post your unwanted items on local online marketplaces. As the saying goes, “One person’s trash is another person’s treasure”...and you can get a good tax write off! The day before I was set to say goodbye to WI, I received the most unexpected news. The reputable moving company I had contracted, with 65 years in business, had filed for bankruptcy and could not complete my move! I frantically began calling other nationally recognized carriers, and all were very willing to help me...for a cost. Due to the short time frame before my closing, I received quotes in excess of $2,500 over what the other company had quoted me (no wonder they went out of business!). At this point, I began considering other options; pack a rental truck and drive it back to Massachusetts myself or pack up a large container in my driveway and hire one of those container companies drop it off in my new abode. Both of these are great options, if you have someone to help you with the heavy lifting. Finally I stumbled upon the concept of a moving broker. Essentially, they take a verbal inventory of your items, then put the job out for bid to smaller storage and moving companies looking for business. Through a brokerage in Miami, I obtained a quote which was less than my original and they were thankfully able to get my move back on track in under a week! Here is the caveat for using a moving brokerage - your move will touch no less than three different vendors. You will be required to pay a deposit to the brokerage, a second installment at pick-up, and a third upon delivery. It is written into the contract that if your inventory or labor exceeds the estimate, you could be up-charged by either crew. This could include packing supplies, walking distance to the household, or unpacking and setting up of furniture. The crew members will collect your agreed upon payment by check or credit card, but keep a good supply of cash on hand for those unexpected charges. I negotiated myself out of the extra charges of re-wrapping some furniture items and some fancy truck parking through the promise of a good tip at the end. Did you know that moving companies, by law, must complete their contracted job within 14 days? After frustrating communication with my moving truck driver over the course of two weeks where he made and broke several promises for early arrival, my belongings showed up at 3pm on day 14. Hotels are expensive, and the pickup and delivery of your goods is not guaranteed a tight timeframe like a FedEx or UPS package. If you are looking to keep costs down and you have friends or family where you can crash, I recommend it. If that’s not an option, an air mattress only costs $50 and is re-usable. As mentioned, utilizing moving brokerages could mean your shipment will pass through several hands. Don’t expect the same level of communication and service that you would receive by using a nationally recognized name as they don’t have to maintain the brand recognition. During my move, I stayed involved by requesting the name and contact information of each company and driver so I could check in frequently on their progress. My new friend Tim is currently driving a truck back to California, where I hear the weather is much nicer than in Massachusetts. Just because your belongings pass through several hands, doesn’t mean they will be mistreated. I found the level of detail of my household inventory very reassuring. The crew at pick-up will take a complete inventory by placing numbered stickers on the boxes which are recorded on a form for your signature. Upon delivery, you will be asked to participate by ticking off each numbered item as it’s placed in your home. A 100% completion of delivery of the inventory is how all three vendors fulfill their contract. Plus, carrying a clipboard and taking down numbers is much more fun than sitting on that air mattress passing time. I am pleased to report that I am now settled nicely into my new home, sleeping soundly in my own bed, and surrounded by all of my (mostly) unpacked belongings. There was only one casualty in the move: a single candle votive, which I foolishly packed under some books. With this complicated adventure now behind me, I’ll take note to not do that the next time I move.